If you have always wanted solar power for your home and if you have been in the dark about what to do, Google’s Project Sunroof might be the answer you are looking for. 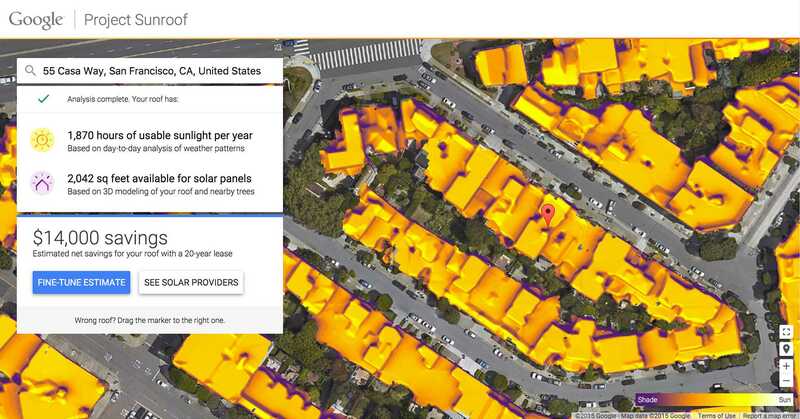 Project Sunroof is a tool created by Google to help you determine your home’s solar power potential and the costs involved. Project Sunroof combines a variety of information: details about your home from Google Maps, nearby solar power providers and local weather conditions to advise you on whether your home is suitable for setting up solar panels to harness solar energy. Carl Elkin, the Google engineer, is the brain behind Project Sunroof. He created this tool when he was using the 20% time that is allocated by the company for all its employees to pursue his/her side projects besides their regular job. The project is expected to begin in a small form and at present will be available only in three cities including Fresno, Boston and San Francisco. Fresno was apparently chosen because the mother of one of the engineers of the project lives there. The cost savings from using solar power in a San Francisco home is estimated like this: If you were to invest $91 every month to lease out solar panels for your home in San Francisco, you could save $14,000 over the next two decades. This amount would be about a month’s rent for a walk-in closet in that city. Using information about the local weather conditions, it is possible to arrive at the number of hours of sunlight you receive every day, after taking into account other factors, including your roof’s angular projections, potential inhibitors of sunlight like trees and/or perhaps a neighbor’s house and seasonal changes. Using the above ‘annual sunlight’ information and the image of your roof from Google Maps, Project Sunroof will be able to give you an estimate of how much of your roof should be covered in solar panels for optimum solar power harnessing. It is recommended that power generated from the solar panels be less than what you really use as there seems to be no financial leverage or ways of storing or using the excess power generated. The residents of the three cities are invited to key in their home addresses in to the Project Sunroof tool. The results as explained above will be displayed for your home, and along with it, the addresses of the solar power providers in the locality will also be available at the end of the page. Project Sunroof is seen as an excellent marketing/advertising tool for solar power installers and providers especially when it is launched across the globe.